Lonely Planet describes Mandalay’s dining scene as lacking the charm and variety of Yangon and Pyin Oo Lwin’s, however a unique dining scene is starting to shape, with these venues topping the list of my new favourite venues. The newest kid on the block is going to make mincemeat out of its competitors, which admittedly in Mandalay’s expat hangout category, are few in number. This attractive, spacious spot is without a doubt going to turn into the 50th Street of Mandalay. Hunter Linton opened his namesake restaurant four months ago, and the Aussie is expanding the menu bit by bit – he told The Myanmar Times that as soon as his chefs nail one dish, he begins adding others. He’s currently renovating the upstairs area into a lounge with pool tables. Diners can choose from an all day English breakfast, pancakes, omelet, pork ribs, toasted sandwiches, a burger with chicken breast and guacamole, or a hearty chicken parma with a side of coleslaw – mains start from K4000. It’s possible to buy liquor by the bottle and the coffee is as strong and the wifi signal, which works without a hiccup. Open daily from 11am. This place is always busy and it’s easy to see why – the grub is mouth wateringly good and the service is casual but stellar. 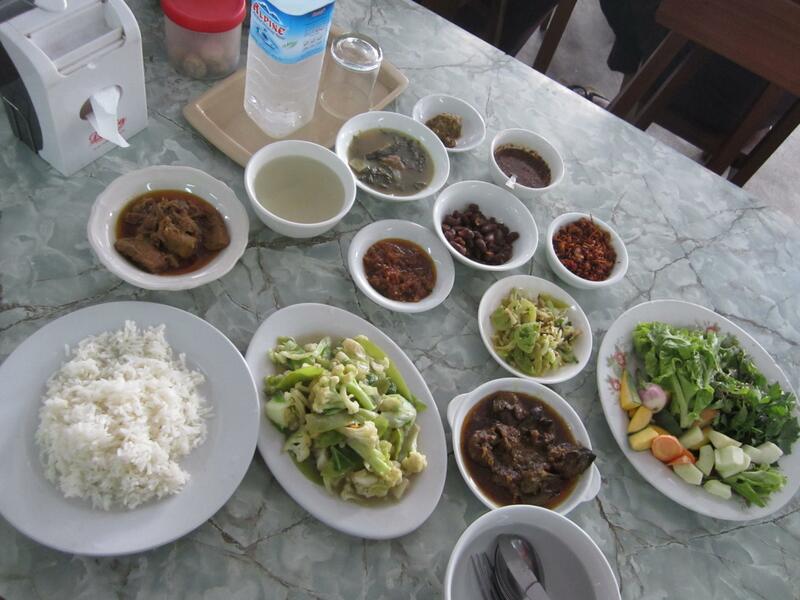 Ordering one main dish is enough – I was hard pressed to eat a quarter of the food that appeared on the table. I counted 11 side dishes in addition to the two mains of lung and liver curry (the liver was more tender than anticipated, though I’m by no stretch an aficionado), and that didn’t include the large helping of mango slices at the end of the meal. Hygiene is one of its strengths: The utensils are brought out in a bowl of crystal clear water and I saw a waitress picking up discarded napkins and food bills from the concrete floor using a pair of long tongs. There’s a fresh juice stand next to the newspapers on sale out the front and if you feel like a spot of shopping, there’s handmade jewellery for sale at the counter. Curries are around K3000 and Myanmar beer is available. 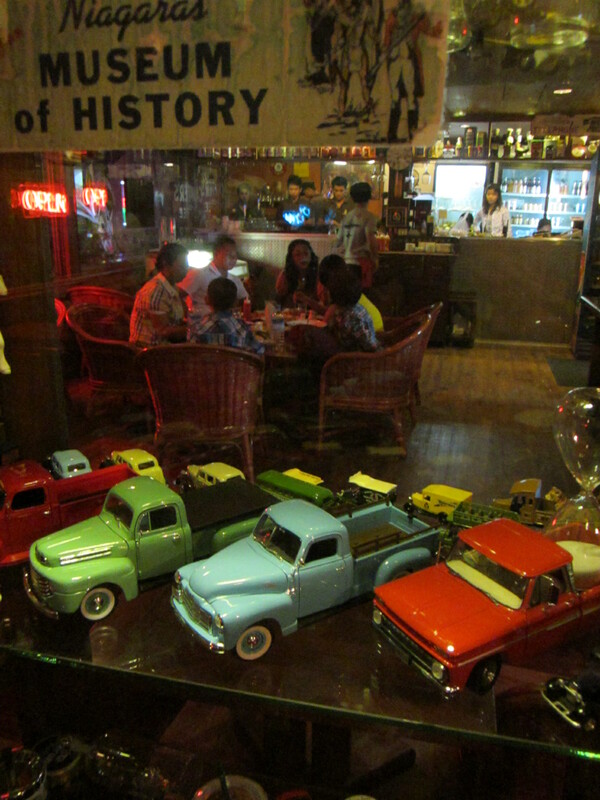 This American-esque diner is located on East Moat Road and is therefore a logical rest stop after pounding Mandalay Hill. The long and narrow restaurant is lined with plum coloured leather booths, which look smart among the wood panel décor that has more than a hint of retro about it. Close to the busy kitchen and bar are glass cabinets full of miniature Holdens and model fighter planes hang from the ceiling (the all male waiter team sports a plane motif on their t-shirts). Some of the dozen or so vintage signs are a tad on the quirky side – notably ‘William Jacks and Co Ltd Sole Agents for Germ Oils Rangoon’ and ‘Steve’s Roadkill Café – You kill it, we grill it.’ As for the food, it’s far healthier than you’d expect a diner style eatery to be. Most dishes are accompanied by a generous collection of steamed veggies and crusty garlic bread, with a plate of yellow watermelon served afterwards. I washed down a tender yet non-fatty kebab with a Mandalay Daisy – a.k.a. orange juice and whisky. As well as a number of Italian and Japanese options, diners can chow down on lobster, which is quite reasonably priced at K9000. The fat grilled fish I saw whisked past me could easily satisfy two people – most were the length and breadth of a keyboard, with the tail and head flopping off the ends of the plate. 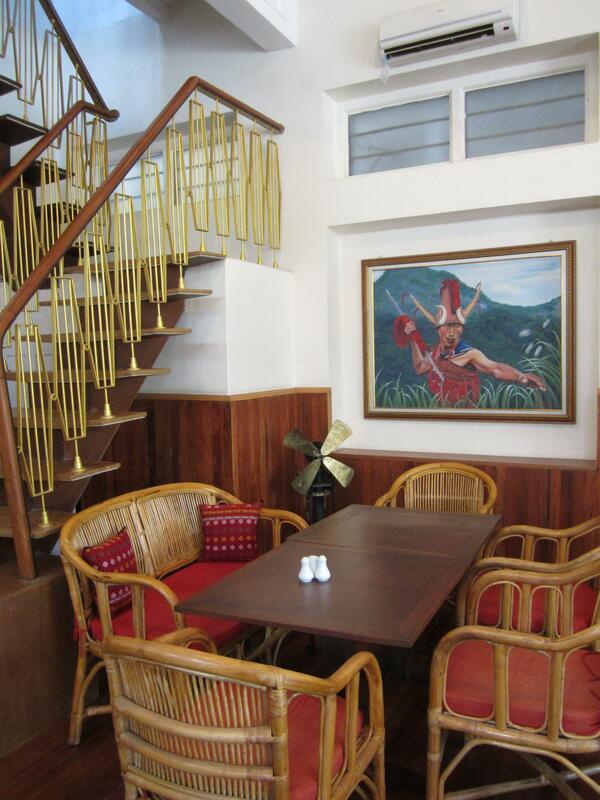 The walls in the back room are made of glass, with a backdrop of lush bamboo plants. Family dining at its prettiest. 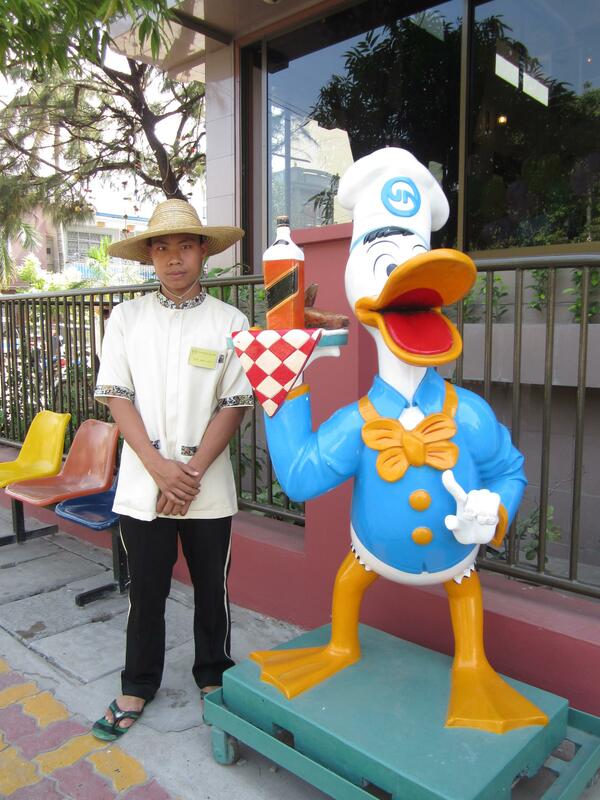 Donald Duck appears to be holding a bottle of Jim Beam out the front of Golden Duck restaurant. The duck served up at this multi-storey restaurant is so good it should be illegal. The waiters are dressed in duckling yellow shirts and they are so busy dishing out the duck to the hundred-odd diners that it’s not uncommon to see them break into a trot. Some wear headsets to coordinate the steady stream of diners. Halves of enormous stuffed pumpkins also seemed a popular choice, however it must be said that the Golden Duck loses points for having shark fin soup on the menu. There’s no dessert menu but no meal is complete until the complimentary traditional sweet pastel coloured jellies are served. Duck is ordered by the half or whole – I was told a half serve wouldn’t be available for 30 minutes but it nevertheless appeared within 20. A side of kale and garlic goes well – with meat this rich and dripping with flavour, a side serve of vegetables is almost obligatory. After devouring several morsels, I was a bit taken aback to see a charred duck head on the bottom of my plate – but perhaps my desire to sanitise the duck dining experience was a bit precious. Very reasonable prices and doggie bags are available on request. Address: No. 192, Corner of 80th Street and 16th Street, Mandalay. This is as much a venue for a liquid dinner as it is for a stylish sit down meal. The palm trees beside the picnic tables are lit up at night with tropical toned lighting and there’s a water feature to boot. A huge acquarium centrepiece dominates the inside décor, which is by far the most experimental in Mandalay. Old world street lamps cast a glow around sunken timber tables and chairs which are almost Turkish in design (‘almost’ because it doesn’t require diners to sit cross-legged). Though the atmosphere lends itself to a lazy shisha, the entire restaurant is non-smoking. 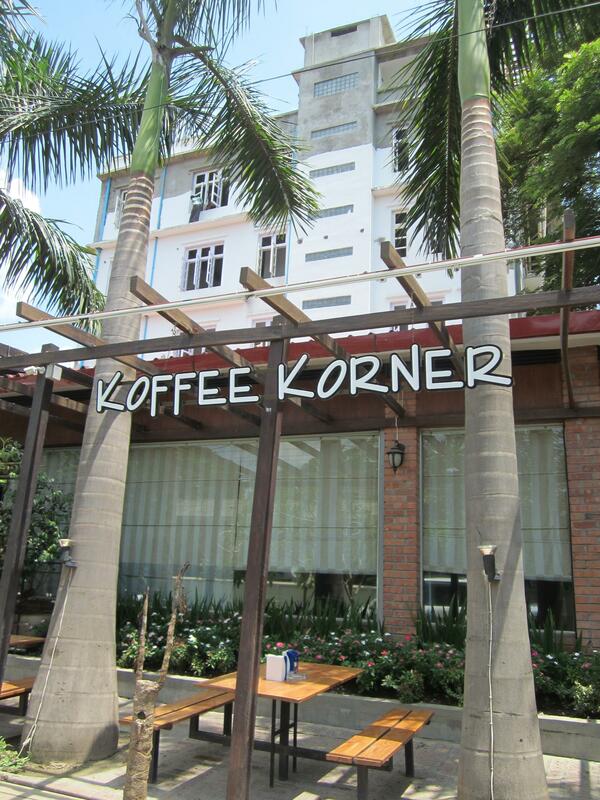 Koffee Korner’s name doesn’t really do it justice because the menu takes on everything – whether it be a Hungarian style mutton stew (K5000), a giant river prawn thermidor a la gorden (read corden) bleu (K6000), pesto pasta (K3500) or a triple decker club sandwich (K2500). I heartily enjoyed the supreme chicken with spinach and mushroom compote (K4500) and it was the one place I chose to revisit for a quick meal before catching my flight home to Yangon. Some of the cocktails are multi-layered (yum) and Tiger beer is available by the bottle. Sadly, there’s no dessert menu but the cappuccinos and other fancy coffees are fantastic. Go there while it’s still the hippest place in town – it opened less than a year ago. Dishonourable mention: Life Café (next to Thein Phyu/Silver Moon Hotel) – because it has a 969 sticker on the door. Previous PostWhere the restaurants have no nameNext PostCan Myanmar cinema get a second act?